This term/bumper sticker started with Dale telling the story of Bob Boardman who was attacked by a mountain goat while hiking in Olympic National Park in Washington state. The story was that the goat gored the man in the leg, then fended off aid for long enough that the man died of his wounds. Bob seemed to think that a goat would very rarely get the upper hand in a fight with a human. And given their spindly legs it should be fairly easy to leg-sweep them in order to get the upper hand, Quote: "You could leg-sweep a goat." 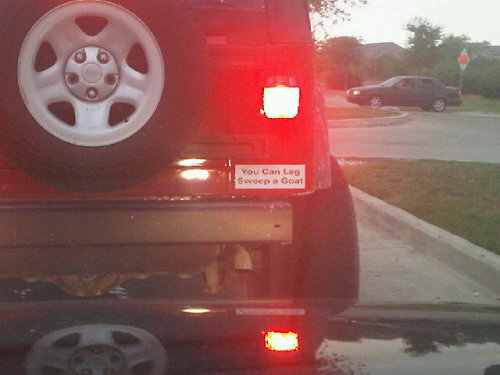 In response to this new catch phrase, Ideal Signs created an extremely limited number of "You Can Leg Sweep A Goat" Bumper stickers that were given away to lucky fans.